Coventry Minibus Hire continues to provide a high quality service to customers in the West Midlands. Bus and coach hire is a highly competitive market and here at Coventry Minibus Hire we know that in order to remain ahead of the competition, we must strive continually to be the best. This means we offer a first class product that fully meets your needs at a price you can afford. From the moment you first contact us, you can be assured that you are in safe hands. You choose the way you approach us. Our Intranet site contains a booking form that you can complete and return on-line. We need to know when your trip is and to where, how many people are travelling, the amount of luggage and any special requirements. Once we receive your booking form one of our highly trained agents will contact you with a no commitment quote. Alternatively telephone our 24/7 helpline, discuss your requirements with us in detail and let our agent answer any questions you have. They will put together the most suitable package for you and tell you how much you will pay. Our pricing structure is simple and there are no hidden extras. 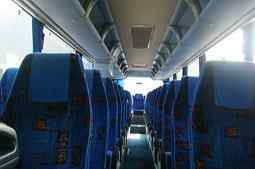 At Coventry Minibus Hire we happen to think that your driver has a very important part to play in making your day a success. All our drivers are recruited from the local area so have a fantastic knowledge of the West Midlands road network. They know how the traffic ebbs and flows and will ensure that the potential for delays on your journey will be minimised by the route they choose. Our drivers are all appropriately licensed and we know that you will find them professional and friendly. We supply a range of minibuses, all varying in size. In particular we are very proud of our Mercedes 16 seater, we also use Volvo’s and even have a Ford Transit at our disposal. All our vehicles are under 6 years old and are subject to a regular maintenance schedule. Before your vehicle is dispatched to collect your party it will have been valeted both inside and out; other peoples rubbish isn’t something you need to worry about when you book with us. Coventry is a thriving city in the West Midlands. It is situated in the country of Warwickshire and covers post codes CV1-CV6. The city has a rich heritage and, as the fort at Baginton attests, dates back to roman times. It was through the streets of Coventry that Lady Godiva rode naked in the 11th century in protest at taxes levied on the local peasantry by her husband. Coventry was bombed heavily in 1940 during World War II, it lost not only the medieval St Michael’s cathedral but also other irreplaceable ancient buildings, 4,000 homes and three quarters of its industrial plant. The new St Michael’s cathedral, more commonly known simply as Coventry cathedral was designed by Basil Spence and is a major tourist attraction. The city is still the focus of urban regeneration as new companies move in to replace the older ones associated with the now declining automotive industry. There is plenty to do and see in Coventry. The Belgrade theatre has a full programme of productions to suit every taste and the city has a number of interesting museums and galleries. Sport has always been a regular feature of Coventry life. Coventry City F.C. play at Rioch Arena and there are excellent local ice hockey, hockey and rugby union teams. The city is served by Coventry airport, its railway station is on the West Coast Mainline and the area is well served by bus companies. Coventry is an ideal location from which to tour, Birmingham is only 19 miles away. Warwick with its magnificent castle and Stratford-on-Avon, birthplace of William Shakespeare are also nearby. 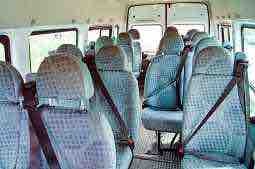 • Booking a minibus is more than likely the most economical option. 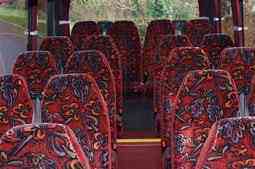 We provide minibuses for all occasions, weddings, prom nights, corporate events, days out. Why not book a minibus for a trip to the Birmingham Genting Arena where acts performing in 2016 will include Justine Bieber, Barry Manilow and Mariah Carey. Perhaps you are arranging for a group of colleagues to visit one of the many huge trade fairs that take place at Birmingham NEC. For Minibus Hire in Coventry you can’t do better, we know that you will be more than pleased and surprised by our level of professionalism and the service we provide for you. I am pleased to say that many of our customers have given us excellent testimonies and return to us on a regular basis. Of course, we are always delighted to see them. Why not join that exclusive group? Ring us today and see what we can do for you.